The new Netflix series Tidying up with Marie Kondo, has been making headlines this past month. In it, Kondo — the world-renowned Japanese organization expert — shows her audience her KonMari method of properly folding clothing in order to maximize storage space. 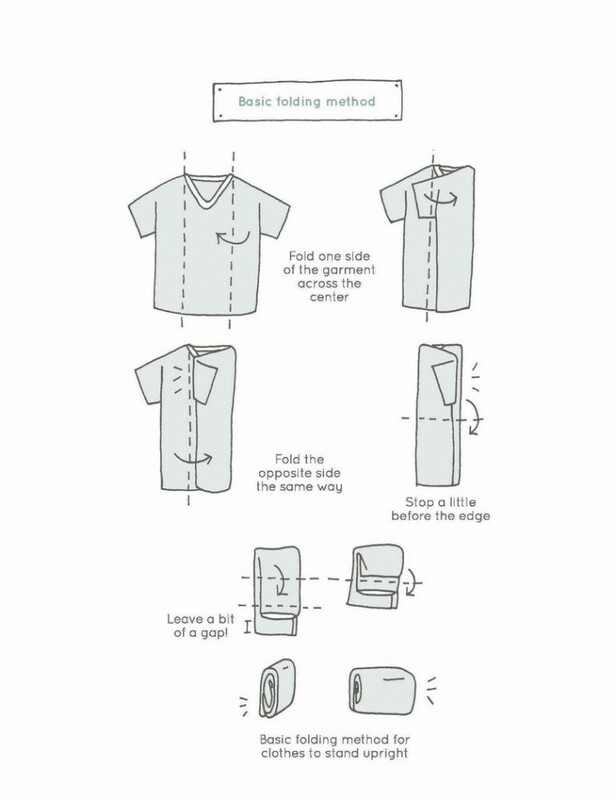 Her technique for folding a T-shirt, for example, only requires 4 folds to dramatically reduce the amount of space the garment would otherwise require. For those looking to tidy their closets and drawers, Kondo’s origami-like folding techniques are useful and simple to master. However, these techniques should not be used by those looking to store and preserve historic garments. There are many ways to store historic garments depending on factors such as the garment’s condition and the materials it is made from. Certain garments, like men’s suit coats, are good candidates to hang from padded hangers. Other garments, like heavily-beaded gowns, should be carefully folded and stored inside a box. This is because the weight of the beads can distort the shape of the gown or, worse, create large tears at the shoulders. A historic garment should be folded as few times as possible. Each fold should be well padded with unbuffered, archival tissue paper or a “pillow” made from polyester quilt batting stuffed inside stockinette or a clean, unbleached cotton muslin tube. A properly padded garment will likely take up a great deal of space, very much unlike Kondo’s tidily folded T-shirts! Selecting the proper way to store a historic garment can be difficult; however, a list of resources to get you started is included below. If in doubt, it is best to contact a conservator who can examine your garment and provide expert advice. All links accessed January 31, 2019.